This fantastic looking box of chocolates was a Christmas gift from my mum. 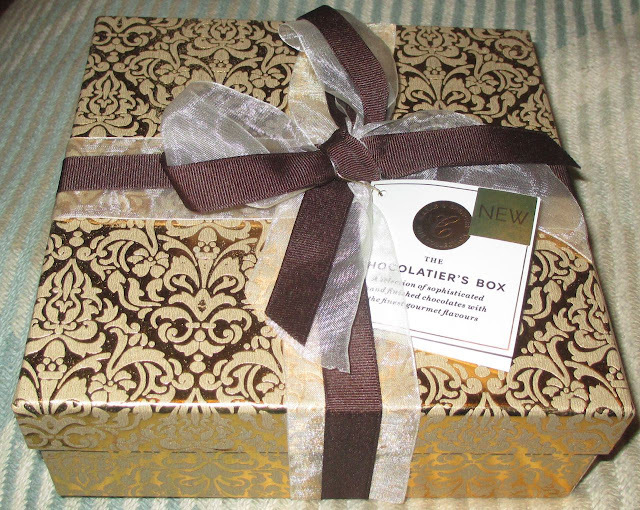 They were from Marks and Spencer and are known as The Chocolatier’s Box. They look very posh, the box is covered with ribbons and they are presented in a beautifully decorated gold box. 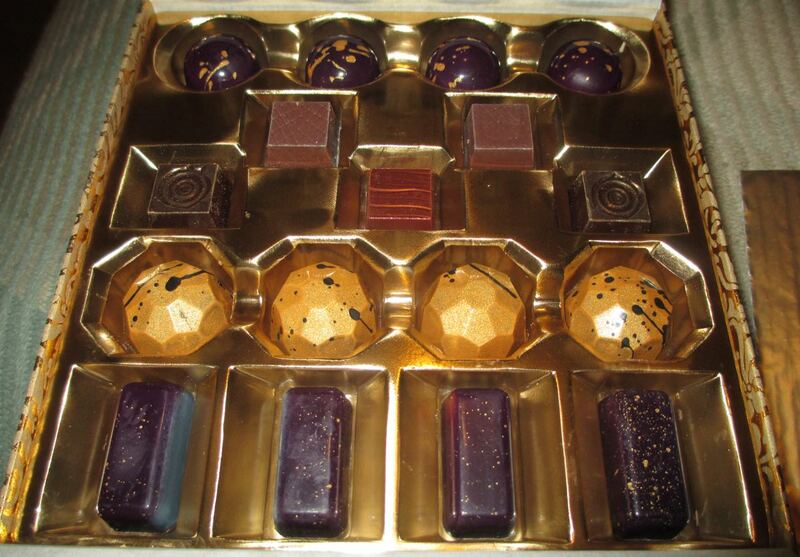 The gold theme continues once the box is opened and the chocolates themselves look like golden jewels. They are so pretty it seems a shame to eat them, but I battled on! 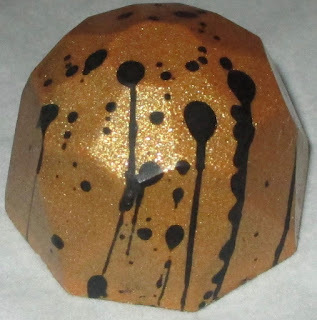 The first chocolate I tried was one of the smaller square ones, decorated with circles on the top. 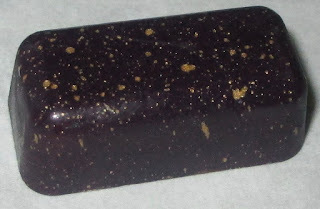 Inside the chocolate shell was a liquid caramel flavoured with ginger. The spice was warm but not hot, and it was balanced by the flavours of dark chocolate. Im not the biggest fan of ginger but if all ginger chocolates tasted like this one, then I would be. 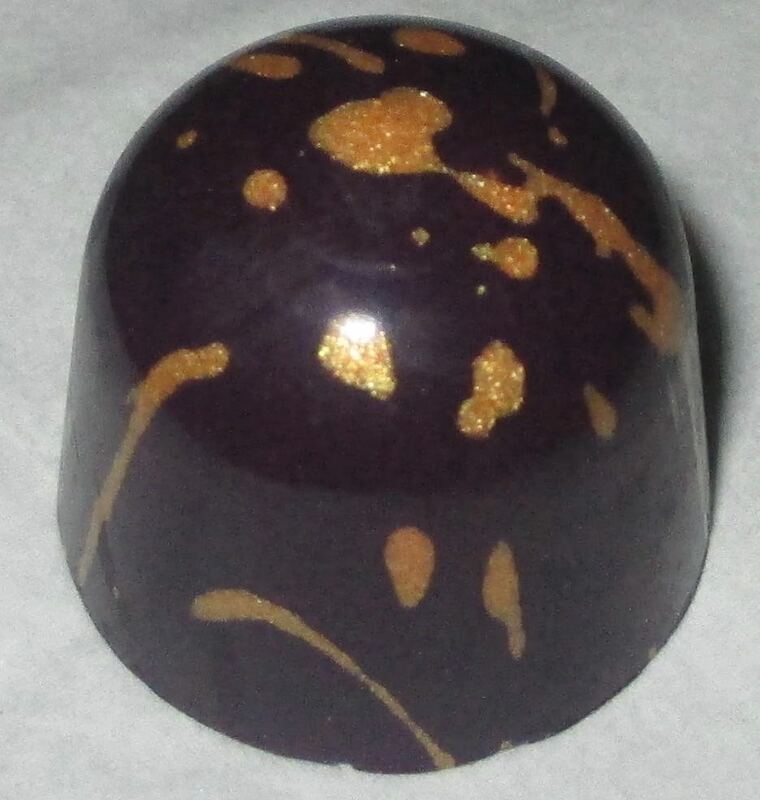 Next up was the large gold chocolate, which is remarkably shiny. The flavour was rather yummy, there was a gentle taste of sweet banana, an unusual hint of smokiness and to finish a gentle spice of cinnamon. They are not flavours that you'd expect to work together but they do. The chocolate was a delight and the hint of cinnamon was genius. This chocolate is oblong in shape, but again decorated with gold. It was also sweeter than its salty name would have you think. I liked the emphasis on the sweet, with the background salt, and thought it worked well. The texture was also lovely as it had lightly crunchy biscuit bits. 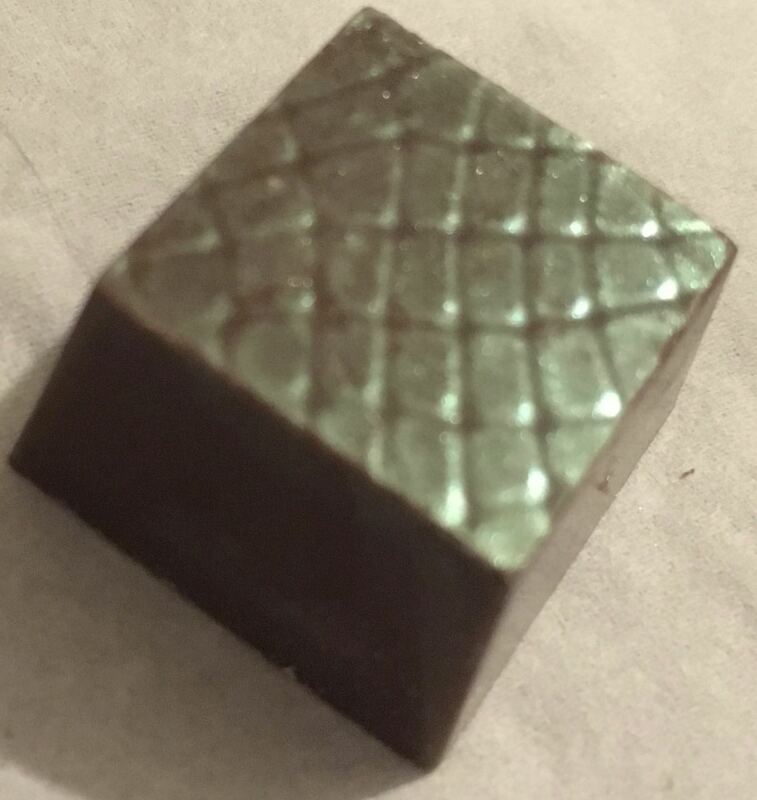 This was another square chocolate, with a green hint. 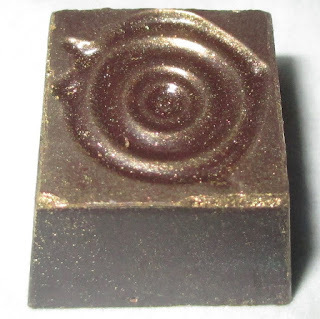 The shell seemed thinner on this chocolate, and broke delicately when I bit in. I wasn't sure what to expect from a chocolate flavoured with fig, but the caramel took centre stage and enhanced the sugary nature of the fig. There was a fruity taste, but it ended up reminding me of a halloween caramel apple, as the toffee taste was so dominant. Being a cinnamon lover, I do like to drink a Chai Latte, so this round gold splashed chocolate seemed up my street. The flavour was amazing, and this soon became my favourite in the box. The chocolate is actually white underneath the coating, and it was just so fragrant and aromatic with flavour that you felt you had to concentrate to fully appreciate its complexities. The mix of coffee, cinnamon, spices and white chocolate was pure heaven. This really isn’t a box of chocolate for scoffing, the flavours are so very different to chocolates I’ve tried before and each one deserves a moment of appreciation. The carefully chosen flavours are a taste adventure, delicate, clever and absolutely delicious. I’m going to have a look in Marks and Spencer and see what other chocolate delicacies are available, I had no idea they sold such a creative range. Did you get any unusual chocolates this Christmas? So much so I got 3 Alarm Cinnamon Hot Tamales which are brilliant!